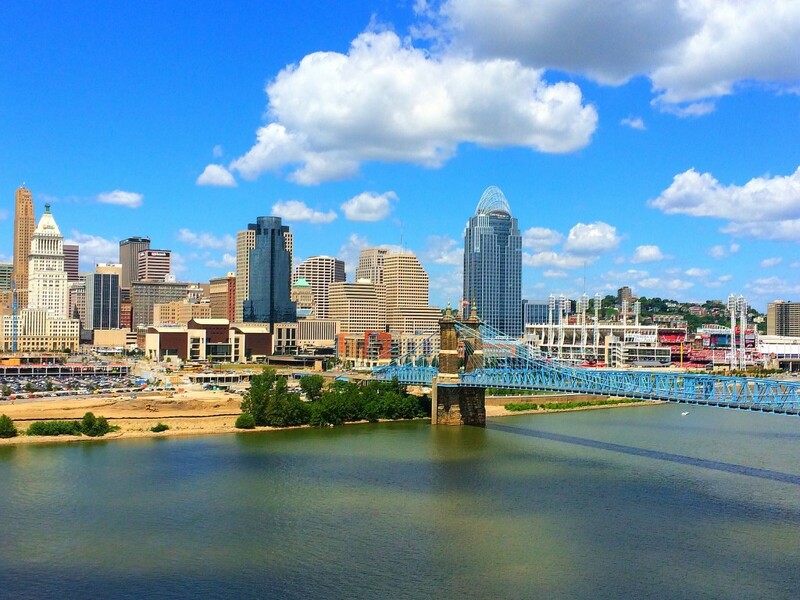 Before mid-August I only knew three things about Cincinnati, Ohio. I used to watch the old sitcom ‘WKRP in Cincinnati’ with my parents, their sports teams and they have a Masters tennis tournament. I literally knew nothing else. So when I decided to go to Cincinnati I didn’t have any expectations at all other than to take in some sports in my 3 days in Cincinnati. View of Cincinnati from across the river in Northern Kentucky. I must say that Cincinnati was much better than I expected and it was a good example of the revival of the old midwestern industrial cities that has been going on for the last decade or two. Most of the revivals have centered on bringing life to the city center and often times are centered around ballparks and stadiums. 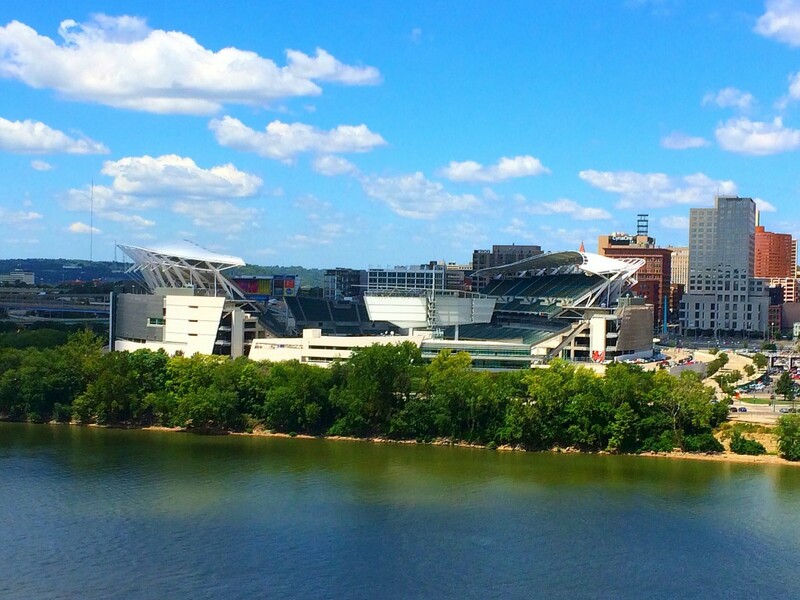 View of Paul Brown Stadium from across the River in Northern Kentucky. 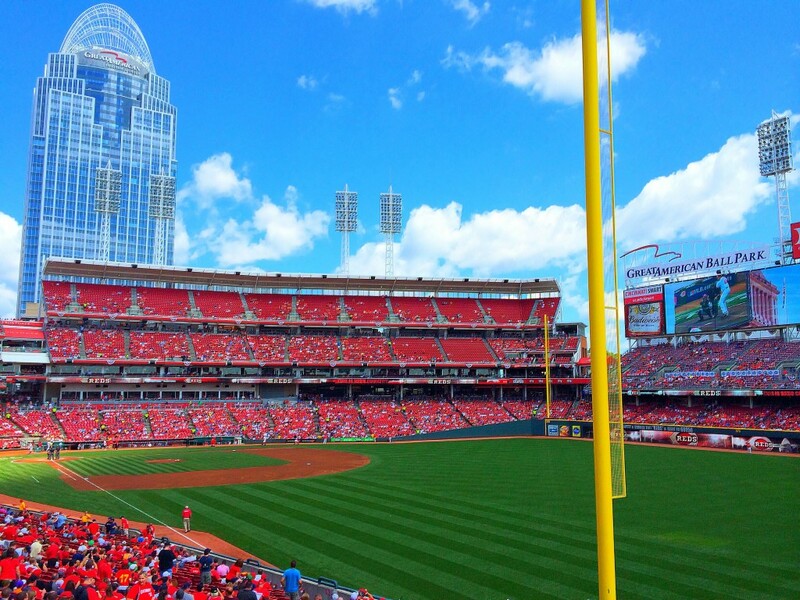 Cincinnati is no different and their urban revival really kicked into gear when they opened two new stadiums for their two professional sports teams, the Cincinnati Bengals of the NFL and the Cincinnati Reds of MLB. View from my seats at Great American Ballpark. 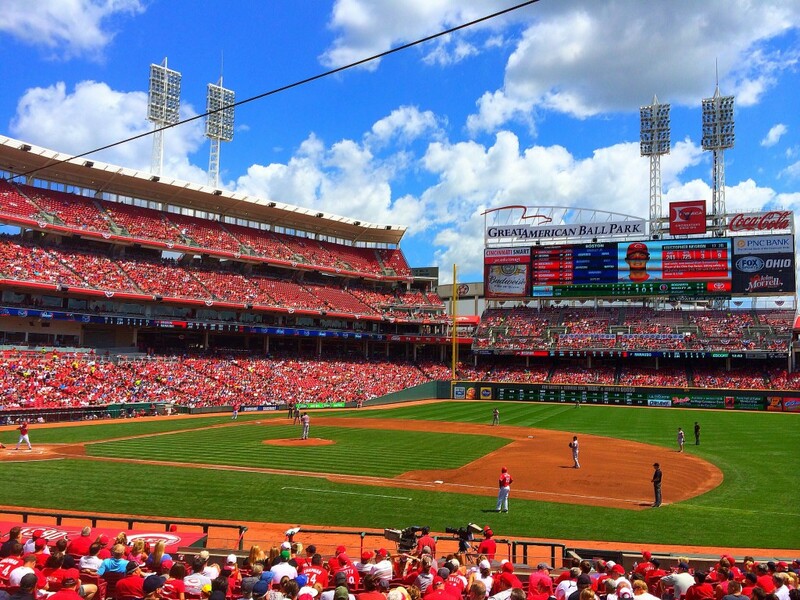 While NFL season hadn’t started yet at the time, I was able to get to a Reds game at their relatively new stadium called Great American Ballpark. What a great Stadium and it will be hosting the Major League Baseball All Star Game next year. View from the right field foul pole with the Great American Building in background. It was a perfect afternoon for a ballgame and I got to take a tour of both the ballpark itself and the Reds Hall of Fame and Museum. As many of you know I am a huge sports fan but baseball is my biggest passion and I know a lot about the history of the game. The Reds Hall of Fame and Museum is the best baseball museum I have seen anywhere in the country with the exception of the Hall of Fame in Cooperstown, New York. It’s even better than the museum at Yankee Stadium! 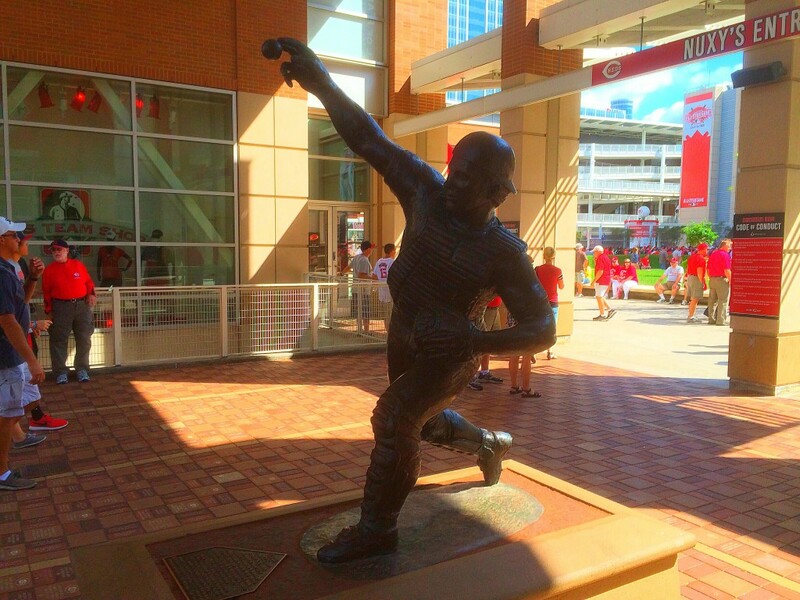 Just look for the statue of Johnny Bench (above) and head right in. Members of the Big Red Machine in the Cincinnati Reds Museum and Hall of Fame. 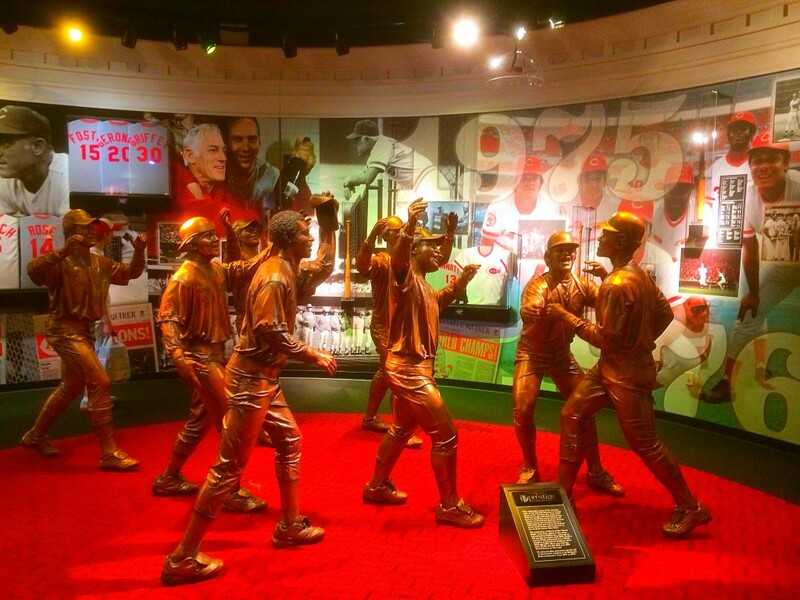 The museum details the history of the club; which has won 4 World Series titles including boasting the Big Red Machine; one of baseballs best ever teams in the mid 1970’s. These statues were pretty cool. 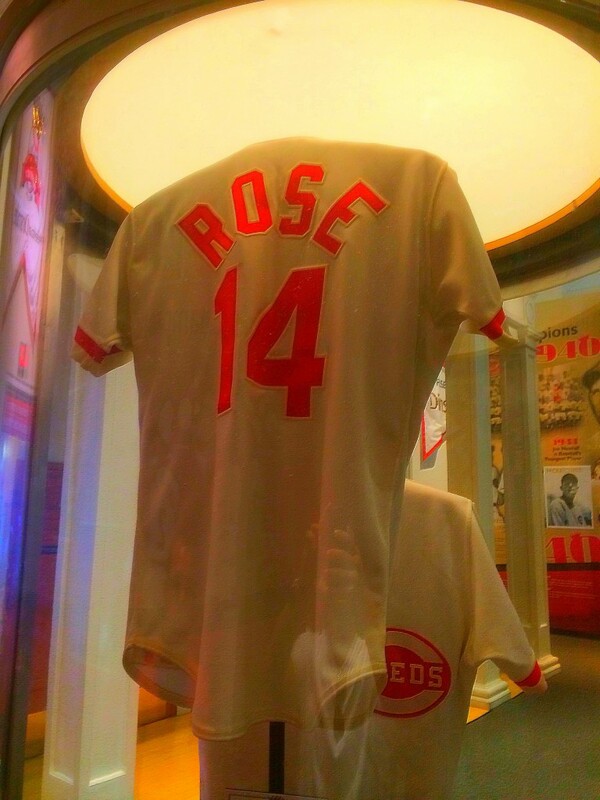 Pete Rose Jersey in the Cincinnati Reds Museum and Hall of Fame. While the Big Red Machine featured some great players including 3 Hall of Famers; the most famous member of those teams is unquestionably Pete Rose. While the Pete Rose saga will likely continue forever, his mark on the game in undeniable and I remember it like yesterday when he broke Ty Cobb’s all-time hit record on September 11, 1985. 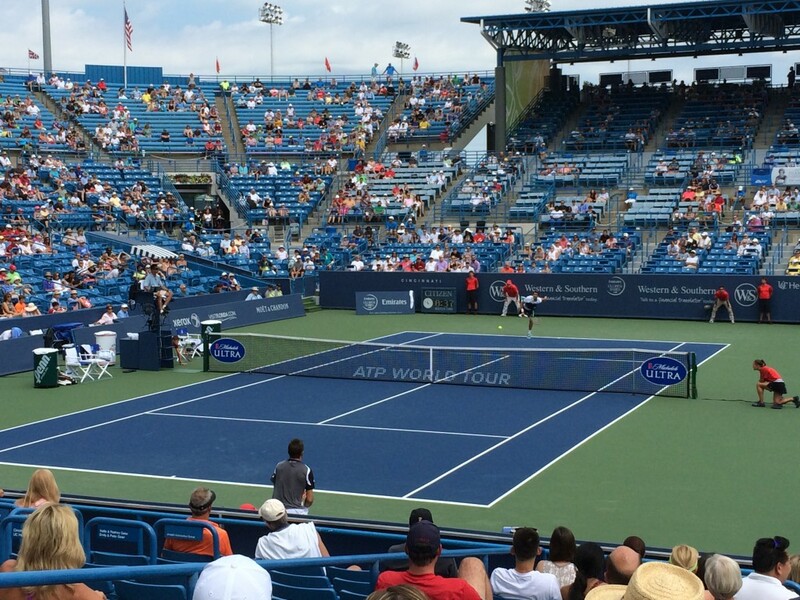 Cincinnati is most famous on a global scale for the Western and Southern Financial Masters Tennis tournament that it hosts each summer. 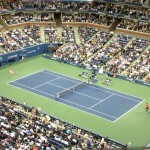 This is the last big tournament before the US Open and is one of the Masters 1000 events that are the biggest tennis events each year outside of the 4 majors. 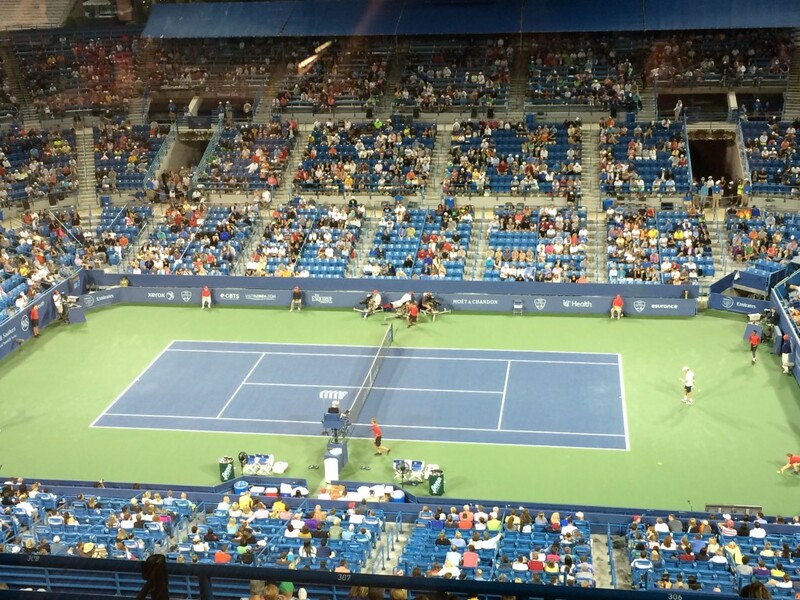 View of Center Court at the Western and Southern Financial Masters tennis in the directors box. I was so excited to go and this meant I have now been to all Masters events in the United States along with the US Open. I was very excited to go and I was invited to the tournament directors box where I was fortunate to meet Cincinnati Reds former MVP slugger, Joey Votto. He is currently on the disabled list so he was able to attend. 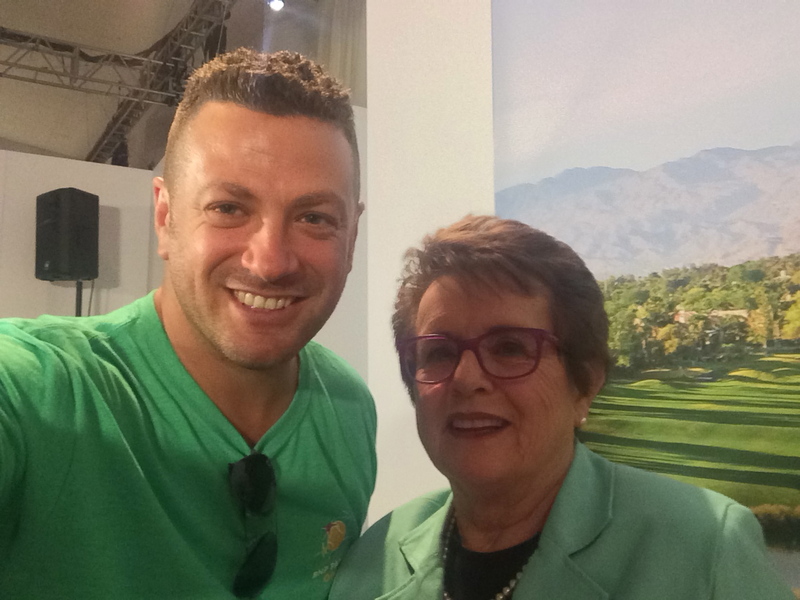 That was a thrill for me and he was very nice. 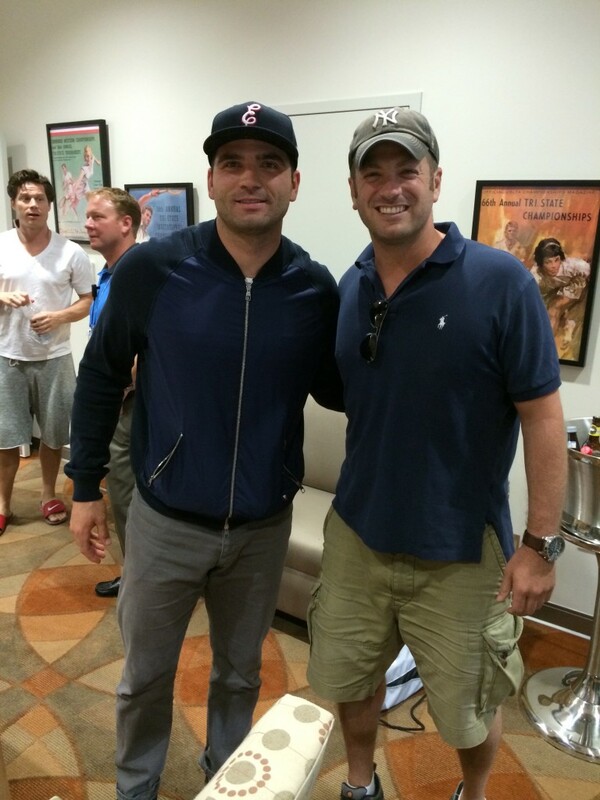 Lee Abbamonte with Cincinnati Reds former MVP Joey Votto at the Cincinnati Masters tennis. 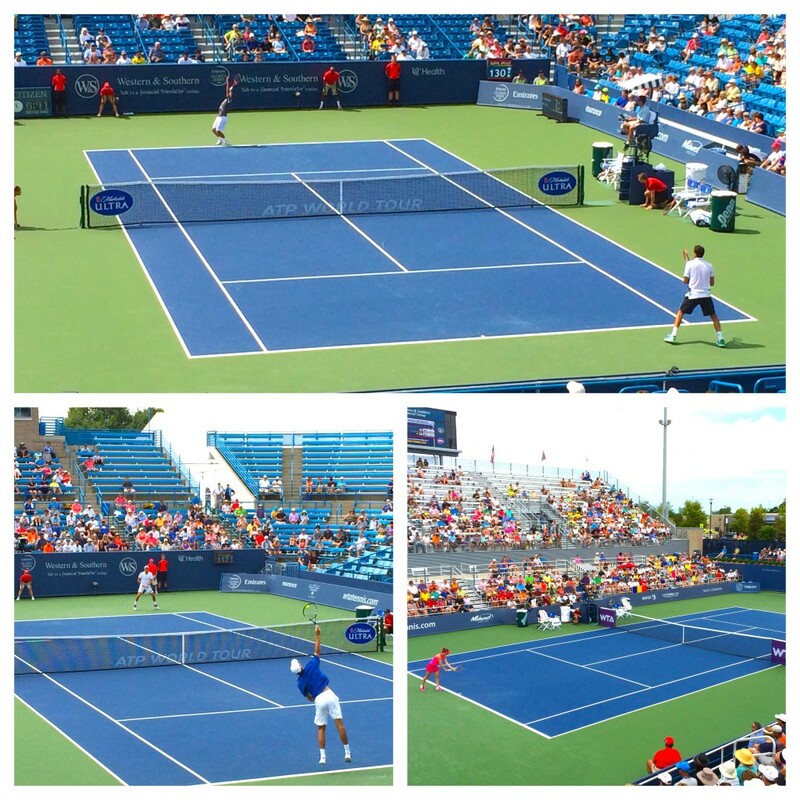 As far as the tennis, the tournament had a small town feel to it; which was refreshing. It actually takes place in Mason, Ohio about 30 minutes from Cincinnati so you will need a car to get there from the city but it is worth it. The venue is excellent and the food is great too. They have set it up like a mini US Open and offer the best of local Cincinnati food. My two favorites won the men’s and women’s tournaments respectively this year, Roger Federer and Serena Williams. 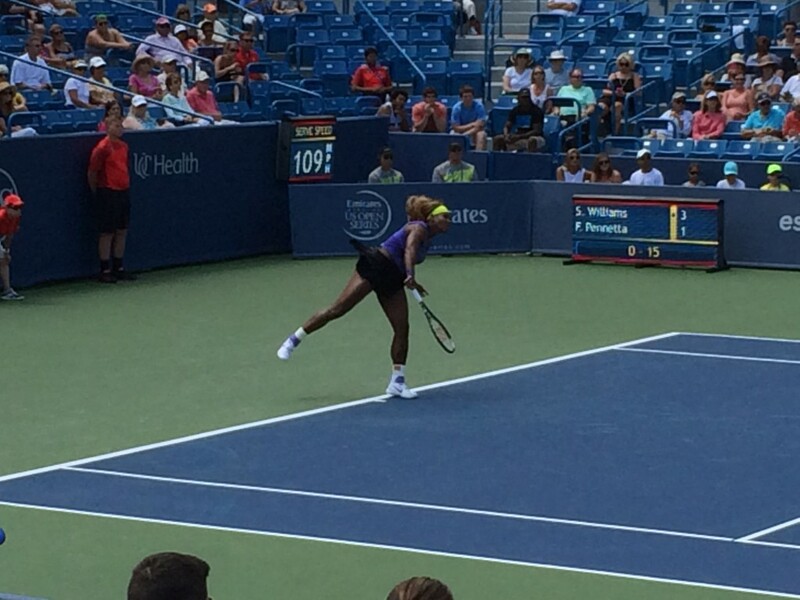 Serena Williams serving at the Western and Southern Financial Masters Tennis. So Cincinnati has a lot to offer the sports fan but it also has some cool culinary delights as well. 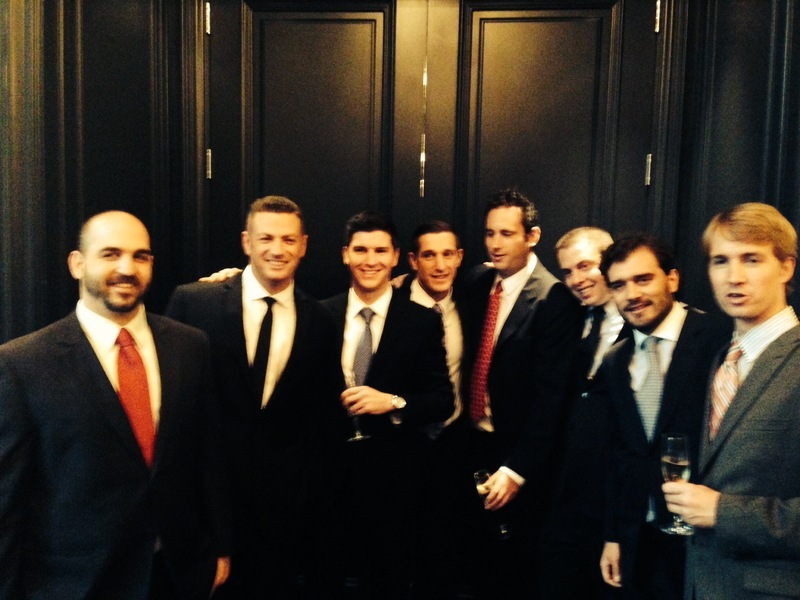 I mentioned the local food but make sure to try a restaurant called Boca, located downtown. It was only a block from the Hilton Netherlands Plaza where I stayed and is the highest rated restaurant in town. 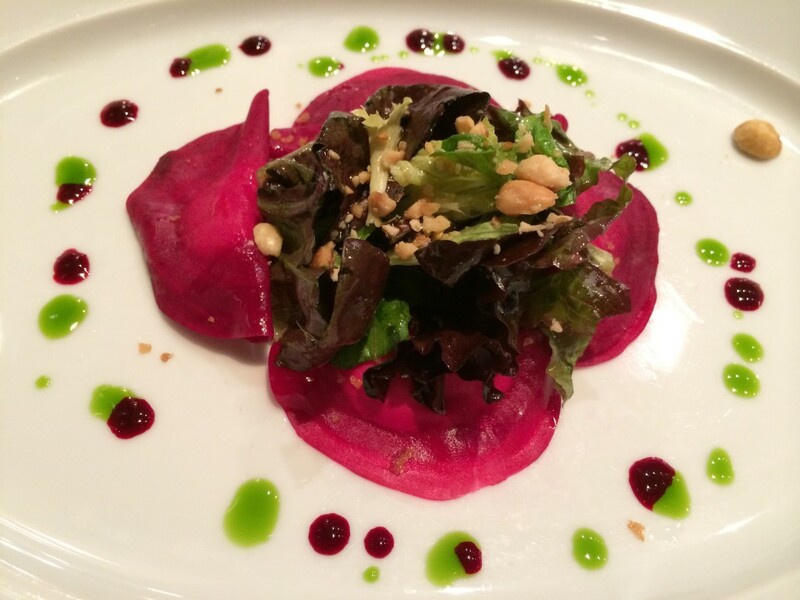 It’s well worth doing a tasting menu. One of the amazing dishes I had at Boca in Cincinnati. Finally, you must walk across the Roebling Bridge; which resembles the Brooklyn Bridge. The reason for that is it was designed by the same guy! You can walk across the bridge and you will actually be in Northern Kentucky; which gives you the best views of the city. 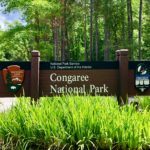 It’s a must see and do on your 3 days in Cincinnati! Glad to hear you enjoyed your time in Cincinnati! I’ve only been there once (a couple of years ago for a friend’s Bachelor weekend baseball road trip) and like yourself, had zero expectations other than to catch the Reds game. The one thing that stuck out a lot in my mind here was the architecture and the cleanliness of the city. What stuck out in your mind the most about this city, Lee? Hey Ray, I thought it was the beauty of the skyline especially looking across from Kentucky. Also, driving the one way streets in the downtown area confused the hell out of me! Furthermore, the chili was off the charts and everything I ate was great. 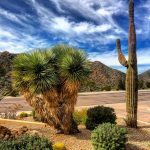 Thanks once again for this post . 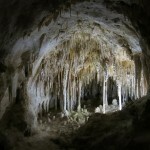 The photos are pretty too! But i want to know if you are very good at playing baseball. Is it a dangerous sport? Glad you have a great time in Cincinatti…is there any city outside of North America that rivals the beauty and cleanliness of Cincinatti? I can handle my own on the diamond…there are a lot of beautiful cities in North America! 3 way on spaghetti with the beans and the cheese. Interesting that they have Pete Rose’s uniform on display if they don’t think it is that bad what he did then the hall shouldn’t. Have you been to all the slams, Lee? It is too bad you didn’t go to Graeters. The location in Hyde Park has all the new and experimental flavors. I have dreams about that ice cream, some of the parks there are are really nice as well, Ault Park, the Botanical Gardens. and as side note, the Roebling Bridge is the first suspension bridge in the world, the Brooklyn bridge was modeled after it. I went to college there and miss it every now and then. If you ever find yourself back in the ‘Nasti.. go get that ice cream.